Blessed with a wooden staircase but not sure how to decorate it? Take the opportunity to add some personality to your hallway by painting the staircase treads and risers. We have seen so many great staircase paint ideas that we just had to pay homage to the trend by sharing some of our favourites and telling you how it is done. So read on, and before you know it you will be poised – paintbrush in hand – ready to tackle this weekend project. Want more decorating advice? Check out the inspiring staircase design ideas in our gallery. While paint is perfect for making over an old staircase, you need to make sure it is in good nick before you start. Repair any loose or broken parts, and fill any dents. You can paint both bare wood and painted wood, but if the stairs are very old and have many layers of paint on, you might want to strip them back first. This can be done using paint stripper, a heat gun or sanding – but take care as old paint may be lead based. Read our guide to maintaining your staircase for more advice on renovation. Once repaired, sand the surface then make sure the stairs are clean and free from dust. Top tip: On bare wood you may want to use a resin and knot blocking primer. While you can use any wood paint, those designed for floors are best as they are designed to be more durable. It needs to be walked all over of course. If you do choose to use wood paint, a satin finish may be more forgiving. However, remember that floor paints are designed to be less slippy. Gloss and satin might be fine for risers, but could prove dangerous if used on the tread itself. For a smooth finish use a small roller but cut in with a paintbrush (see our pick of the best). Start early and preferably when everyone is out for the day. You need to factor in drying time which will be at least a few hours to be touch-dry and longer before you should be walking on it. If your only loo is upstairs, you might need to plan an alternative. It may sound obvious, but start at the top and work down so you don't get stuck upstairs (unless you are painting upwards from a basement of course). The simplest way to add impact to your hallway is with a bold contrasting colour on your staircase. This is great if you have gone for a neutral scheme for your walls. Be brave. Bright yellow? Why not? Neon pink? Hot, hot, hot. Teal? Now you're talking. 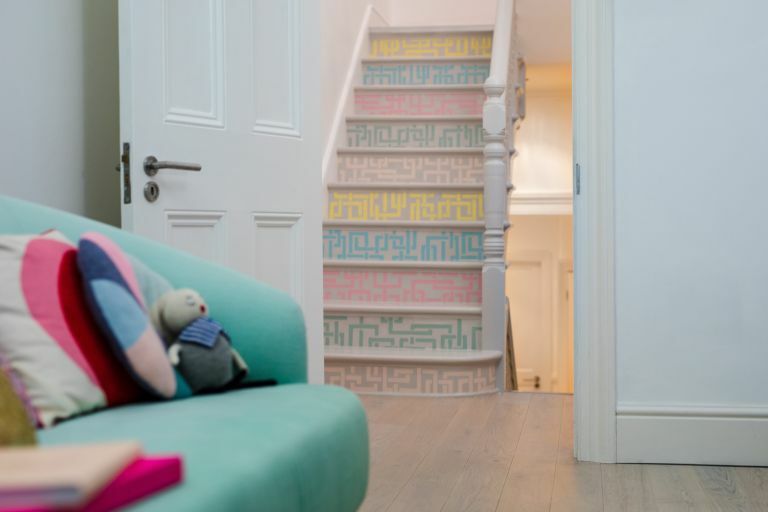 Treads one colour, risers another – colour blocking is super easy on a staircase. You could even paint alternating steps different colours, or you can split the staircase vertically, horizontally or even diagonally in two tones. The ombré trend is made for stairs. It looks best if you start with a darker shade at the bottom, getting lighter towards the top. Use a sponge to blend the colours in the middle. Find out more about creating an ombre paint effect. If you want to add a design, try using a stencil if you don't trust your freehand skills. The options are endless with so many stencils available. You could number the risers to count your way up the apples and pears, or buy a set of letter stencils and let your stairs do the talking. Let your passion inspire how you paint your stairs. Literature lovers will love the book spine decorating idea below, but you could also decorate with your favourite song lyrics, or maybe a repeat pattern of your favourite flowers. Paint the treads, then add some pattern to the risers with wallpaper. You could decide to match this to your hallway wallpaper, but remember that if you do paper the stairs, it will benefit from a coat of hard-wearing clear varnish to keep it looking pristine. Use paint to create the illusion of a stair runner by painting just the outer sections of each step. We love how on this staircase, the wood has been left bare in the centre and just pops of yellows have been painted onto the edges. Very clever. For a similar sunny yellow paint try Farrow & Ball's Babouche.